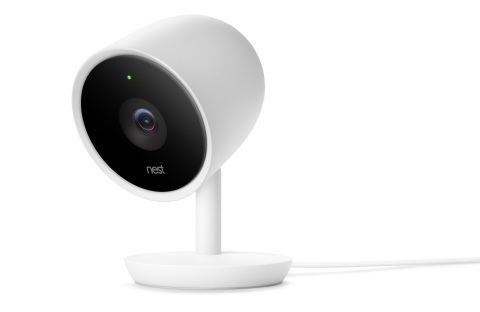 Following on the heels of a big leak comes the official launch of Nest’s latest security product, the Nest Cam IQ. As the name suggests, this new indoor security camera packs a bunch of intelligent features, not the least of which is a high-quality zoom function called ‘Supersight’ that utilizes the Cam IQ’s 4K image sensor. Cam IQ joins Nest’s Cam Indoor and Cam Outdoor models. The Nest Cam IQ features an 8MP 4K image sensor alongside 12x digital zoom, HDR, and a pair of 940nm infrared LEDs. Though the camera features a 4K image sensor, the video feed is presented in 1080p. The extra pixels are utilized as part of the aforementioned ‘Supersight’ feature, which intelligently zooms in on subjects of interest without a loss in image quality. Joining ‘Supersight’ is a feature called Person Alerts, which sends the camera’s owner a special alert including a zoomed-in photo when a person is detected in the video feed. Other intelligent features include audio alerts for sounds coming from places beyond the camera’s video feed, as well as Familiar Face Alerts, which utilizes facial recognition technology to determine whether someone in the video feed is known or unknown. Cam IQ utilizes 128-bit AES with TLS/SSL encryption to protect stored and streaming video content. Some of these intelligent features, such as Person Alerts, are available for free on Cam IQ whereas they require a Nest Aware subscription for past Nest cameras. The Nest Cam IQ can be preordered now in the US for $299, and will soon be available to preorder in Europe for £299 GBP and €349 EU. Shipping will start in late June.